Aspen tree's in Colorado are famous for their vibrant golden color during the Autumn season. 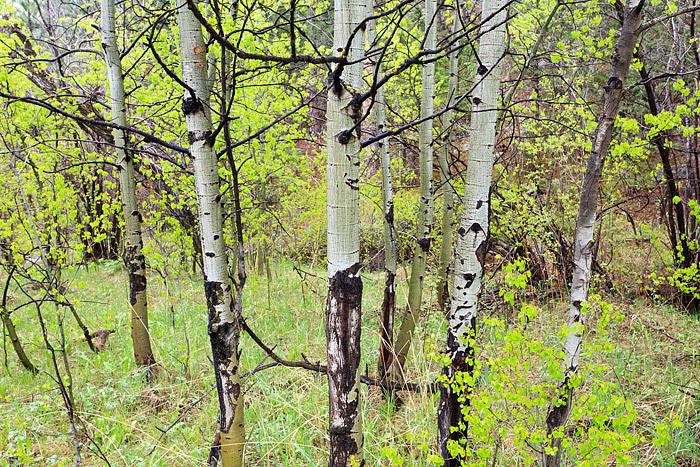 Aspen tree's however, put on an equally impressive show during their spring leaf out. For a short window of time, the spring leaves on the Aspen tree's take on a lime green like transluscent that is in my opinion equally as impressive as their Autumn hue. This small Aspen grove near the top of Gregory Canyon is one of my favorite locations to photograph Aspen tree's when hiking along Boulder many great Open Space locations. Photo © copyright by Thomas Mangan.